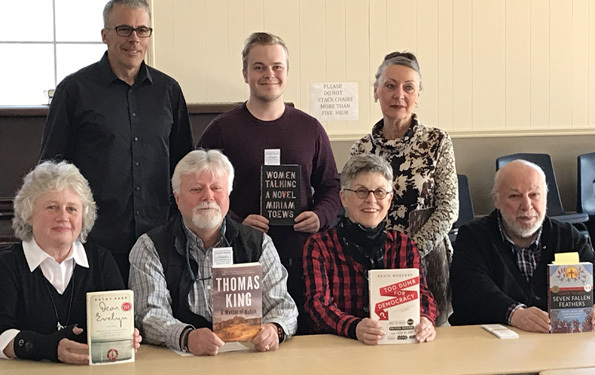 A time-honoured tradition for local literati returns April 25 as five new book champions will have an opportunity to grace the stage with moderator Ken Murray to defend their titles. – Trevor Brookes is a social finance specialist at Community Futures of Prince Edward-Lennox and Addington. The county native has spent much time reading over the years, making his way through Queen’s University to his current position where he must keep on top of analytical trends. His reading choices currently involve a lot of non-fiction, though he notes he’s come to appreciate good stories in all their trappings. Brookes has selected Women Talking by Miriam Toews, which is a finalist for the Governor General’s Literary Award this year. The story is told from the perspective of a young scribe, August Epp, sitting alone in a hayloft while overhearing eight women debating a life-altering choice for their Mennonite colony that must be made within 48 hours. – Bill Roberts is well known in the county for his work as Sophiasburgh’s municipal councillor. He has his own history of storytelling however as a contributing editor for Outpost magazine. A long-time broadcasting executive, Roberts spent time as a managing director for TV Ontario and also was a leader at networks like Vision TV, One, and ZoomerMedia Ltd. He holds an honorary doctorate in sacred letters from the University of Winnipeg and has worked aside some notable luminaries including former German chancellor Willy Brandt, a Nobel Peace Prize winner. Recently, Roberts documented his own month-long journey in Antarctica. His book of choice will be Thomas King’s A Matter of Malice. The story’s protagonist is invited to investigate a cold case for a reality television show. He’s reluctant, but then finds the television producer that invited him to participate killed in a similar manner to the original crime and he can’t resist digging into the mystery. – Sally Keefe Cohen, a literary consultant who has represented the interests of Canadian writers and their estates for more than a quarter-century made a cottage outside Milford her full-time home two years ago after being a part-time resident of the county sine 2011. – Bernie Finkelstein has played a big role in the Canadian music industry and True North Records, the independent recording company he started in 1969 has released works from a range of internationally known artists including Bruce Cockburn, The Rheostatics and 54-40. The company has had a hand in 40 Juno Awards and 40 gold and platinum records. Finkelstein, a member of the Order of Canada and a winner of the Walt Grealis Special Achievement Award, the highest honour bestowed at the Junos for a non-performer, has a country home in the county and he’s been actively involved in several local initiatives like 99.3 County FM and the County Coalition for Safe and Appropriate Green Energy. Finkelstein will champion Seven Fallen Feathers: Racism, Death, and Hard Truths in a Northern City by Tanya Talaga. The non-fiction title tackles the hot topic of truth and reconciliation with Canada’s Indigenous communities through the stories of seven Indigenous high school students who died in Thunder Bay, Ont. between 2000 and 2011. Each of the seven members of the Nisnawbe Aski Nation were far from home in pursuit their education. The book explores the circumstances of lives and deaths and addresses them in relation to the broader issue of human rights abuses over generations. – Elizabeth Etue, an author and producer, has offered some definitive works on female hockey, co-authoring On The Edge, Women Making Hockey History and Hayley Wickenheiser – Born to Play. She also was the writer and producer of a one-hour documentary Chasing The Dream — Women’s International Hockey, which was broadcast on CBC in 2002. More recently, she co-produced and co-directed a point-of-view documentary on sexual abuse, She’s Only Six, for CBC Newsworld. Etue’s book of choice is David Moscrop’s Too Dumb For Democracy: Why We Make Bad Political Decision and How We Can Make Better Ones. A fresh release this month, Moscrop’s book examines the populist age that gave rise to the likes of Donald Trump and Brexit and looks at the impact of environmental impacts, the media, and institutions on the decision-making process. Moscrop, a post-doctoral fellow at the University of Ottawa’s communications department offers his thesis on how to improve democratic function. Tickets for County Reads are available at peclibrary.org for $5. There is often great interest, so it is recommended to book early. The show will begin at 7 p.m. April 25.